I had the pleasure of chasing with Weather Adventures and Blake Knapp this season, right after my chase with Silver Lining Tours. It was interesting to chase with two very different tour companies in the same season. I took the 10 day tour with Weather Adventures during this, overall, bad chase season. Out of the 10 chase days we were able to chase 7 days, which was pretty good, but the overall setups were not very impressive, with a few exceptions. In SPC terms, we had three 5% days, and four 2% days but constantly with an upper wind support problem. The storms died off, or congealed into MCS, early every day – as was the case on most chase days this season. Compared to Silver Lining Tours, Weather Adventures is a much smaller company that have been around since 2014. It is run by Blake Knapp who used to be a tour driver for Extreme Tornado Tours but now runs his own tour company. When I chased with Weather Adventures we were only four tour guests (out of a maximum 6) which was really nice. The three other guests were all returning guests, some who have been chasing with him since the start. Weather Adventures, and Blake Knapp, runs a very personal tour and as with most smaller tours it feels more like chasing with a couple of friends than being on a storm chasing tour – both for good and bad. The positive part of this is that it almost feels like a private tour. Blake is very eager to share his knowledge and you are constantly in the loop on what is going on. We started off with two down days which was quite fortunate since the van needed some repair. Blake had to rent a Suburban so that we could spend the down days in western Colorado, instead of waiting in Denver. Those two days were magnificent and I am sure it wasn’t cheap renting that Suburban – this shows a great deal of dedication to making the tour guests have a great time and how service minded Blake is. Something I really liked was the morning briefing where Blake went through the forecast of the day and really put an effort into making us all understand what was going on, allowing time for questions etc. I learned a lot during those morning briefings, especially since Blake always took the time to explain everything in detail. While chasing, this was also the case, Blake was always very eager to explain everything which was very informative. In terms of chasing and getting to the right targets, Blake did a good job on getting us to the right storms and positioned well most of the time. What he may miss in experience, compared to other tour guides, he makes up for in gut feeling it seems. Storm chasing this week was tough as most storms went up and rather quickly died before they had the chance of becoming tornadic, often in places with bad road networks, so targeting the right place and positioning for the storm was very important, but also difficult. The best tornado of the year was during this period, Laramie (Wyoming), and just as almost everyone else, we missed out on it. It seems like Blake took it quite hard, especially since we never saw a tornado, and it kind of changed the mood in the van for the second half of the tour. A great thing about chasing with Weather Adventures is that Blake is quite a food connoisseur and he always found excellent restaurants in every corner of the Plains and we hardly ever went to fast food restaurants unless we specifically requested it. It was more expensive but often delicious. In addition, we always stayed at comfortable quality hotels as well. 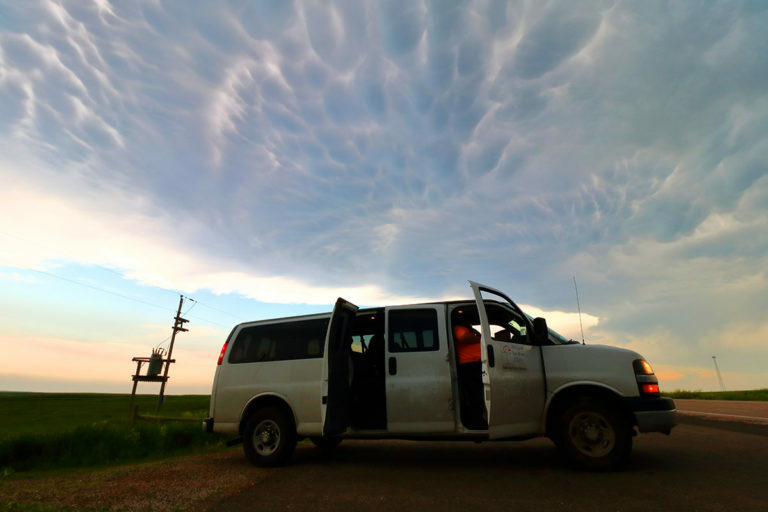 The van was one of those 12-seat vans that most larger storm chasing companies use and, just as with them, I was not too comfortable. The lack of head rest, curved seats, and leg room makes the 5-10 hours a day in the van quite tough. As mentioned before, many tour companies use these vans but I just wish they would find better options. During our chase the van was also quite messy and dirty already from the start of the tour which I wasn’t too impressed with. I recommend Weather Adventures for your storm chasing tour. Blake, and his driver Drew, were both very eager to make the tour comfortable, fun, and exciting for us – especially since the weather did not play along too well. Blake has a humor like no one else and constantly amused me with new words or sentences in Swedish that he learned. He is a true people’s person and I believe he really loves chasing with tour guests and perhaps especially guests from overseas.